Simple. Powerful. Relevant. 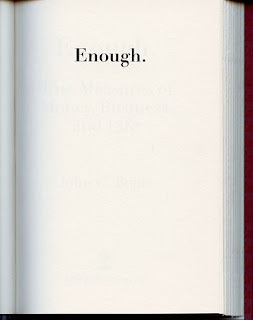 The opening page to Enough. True Measures of Money, Business, and Life by John C. Bogle (published 2009 by John Wiley & Sons, Inc., NJ) is one of the most elegant page layouts I've seen in a long, long time. Mr. Bogle is founder and former CEO of the Vanguard Mutual Fund Group and often considered the 'conscience of Wall Street.' In an interview this past year he said "We Americans are one lucky bunch. But let's face the truth. While the Declaration of Independence assures us that 'all men are created equal,' we'd best face the fact that we may be created equal but we are born into a society where inequality of family, of education and, yes, even opportunity begins as soon as we are born." In Enough, Mr. Bogle writes of the problems he sees in the contemporary world of finance. A world that is "marked by too much cost, and not enough value; too much speculation, and not enough investment; too much complexity, and not enough simplicity. Similarly, our business world is focused too much on counting and salesmanship, and not enough on trust and stewardship; and our society at large is too obsessed with charisma and wealth, and not enough with character and wisdom." "At a party given by a billionaire on Shelter Island, Kurt Vonnegut informs his pal, Joseph Heller, that their host, a hedge fund manager, had made more money in a single day than Heller had earned from his wildly popular novel Catch-22 over its whole history. Heller responds, "Yes, but I have something he will never have...enough." "Enough. I was stunned by the simple eloquence of that word - stunned for two reasons: first, because I have been given so much in my own life and, second, because Joseph Heller couldn't have been more accurate. For a critical element of our society, including many of the wealthiest and most powerful among us, there seems to be no limit today on what enough entails." Ringling Brothers and Barnum & Bailey Circus will begin performing its 139th edition at Madison Square Garden in NY this week. Tens of thousands of children and adults are entertained each year, while some take issue with animal rights and others confront their childhood fear of carnies and clowns. 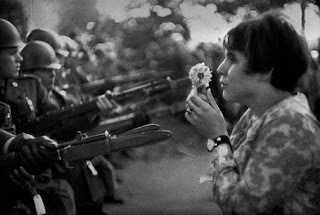 The truth is what's there to be afraid of but "Man's inhumanity to man?" "There was a cold drizzle on that afternoon when I first saw the dwarf. He was standing alone outside the tent smoking a cigarette. His distorted torso, normal-size head, and stunted legs both attracted and repelled me. He was dressed in a "Little Tramp" costume wearing a tux with tails, sporting a black derby, and holding a small bouquet of fake paper flowers. He stood there pensively in the privacy of his inner thoughts. As I moved closer he sensed my presence but the click of my camera shutter did not seem to disturb him. He seemed to know that it was the inner moment I was drawn to and not his clown face or physical appearance. 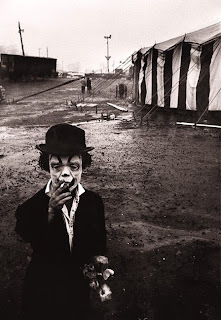 I wanted him to be himself and not act the clown because I was taking his picture. 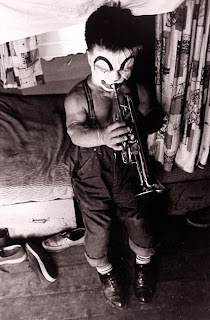 He was waiting for the musical cue that would send him into the brassy sounds and glitter of the wonderment world exuding from inside the big top." "He disappeared into the tent and I felt his loneliness and at the same time a certain power standing over a man less than half my height." 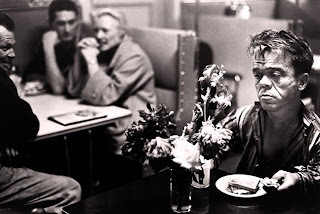 Bruce Davidson is represented by the Howard Greenberg Gallery, NY. 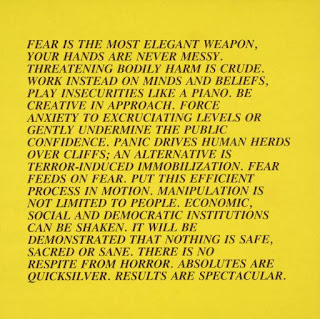 Conceptual artist Jenny's Holzer's Protect Protect exhibition is now on view at the Whitney Museum of American Art from March 12 - May 31, 2009. Follow this link to Roberta Smith's art review in the New York Times. "The Inflammatory Essays present a range of provocative statements which were inspired by the texts of political theorists, religious fanatics and impassioned 'folk' literature. 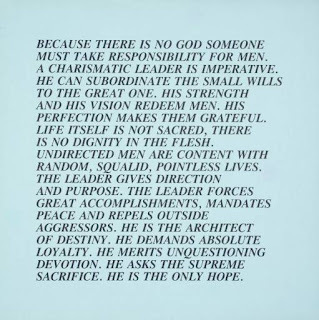 Since childhood, Holzer has been interested in 'rapturous writing' and wanted to write 'ecstatic, fantastic things'." 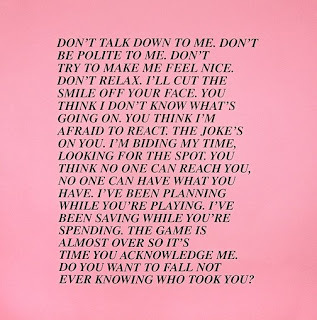 "Each essay has exactly 100 words in twenty lines, and Holzer uses this rigid format to explore a range of extreme ideas. She questions the viewer's response by setting fanatical statements against the certainties of common opinion. Originally the Essays were fly-posted across New York City." Way back in the days of graduate school, I remember reading that the best poets hoped to make a modest few thousand dollars from their writing per year. The obvious question from an Average Joe or Jane, or perhaps one's parents would be "Well, why do it?" Why be creative? It's not easy to speak of inspiration, or creative energy, or guiding principles when the world view of success is quite the opposite. As everyone knows though, the best writing and the best art can sometimes make the act of living an easier pill to swallow. 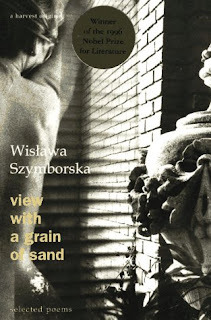 Polish poet Wislawa Szymborska (born 1923) is a writer and an artist in the best sense of the word. 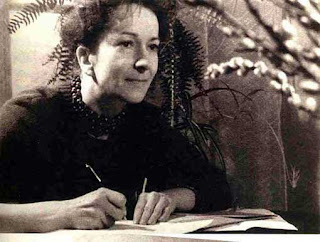 In 1996, she was awarded the Nobel Prize in Literature for her poetry. Ms. Szymborska's words of acceptance speaks with dignity about the process of writing, and shows her humility and mindfulness in having been chosen for this award. They say the first sentence in any speech is always the hardest. Well, that's one behind me, anyway. But I have a feeling that the sentences to come - the third, the sixth, the tenth, and so on, up to the final line - will be just as hard, since I'm supposed to talk about poetry. I've said very little on the subject, next to nothing, in fact. And whenever I have said anything, I've always had the sneaking suspicion that I'm not very good at it. This is why my lecture will be rather short. All imperfection is easier to tolerate if served up in small doses. When I'm asked about this on occasion, I hedge the question too. But my answer is this: inspiration is not the exclusive privilege of poets or artists generally. There is, has been, and will always be a certain group of people who inspiration visits. It's made up of all those who've consciously chosen their calling and do their job with love and imagination. It may include doctors, teachers, gardeners - and I could list a hundred more professions. Their work becomes one continuous adventure as long as they manage to keep discovering new challenges in it. Difficulties and setbacks never quell their curiosity. A swarm of new questions emerges from every problem they solve. Whatever inspiration is, it's born from a continuous "I don't know." Holy Batman! 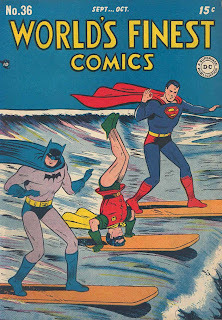 Vintage World's Finest Comics cover. "The worst thing about the surf industry is that it's an industry," said Casey Cagle, 19, a surfer and sales associate at Jack's Surfboards in Newport Beach. "It's no longer a culture." I think I know what young Casey's talking about. Does the idea of soul surfing exist anymore? "By imperceptible steps, art history gently drains away a painting's sheer wordless visceral force, turning it into an occasion for intellectual debate. What was once an astonishing object, thick with the capacity to mesmerize, becomes a topic for a quiz show, or a one-liner at a party, or the object of a scholar's myopic expertise. I am still very much interested in Bellini's painting. But the picture no longer visits me in my sleep, or haunts my thoughts, or intrudes on my walks in the countryside. It no longer matters to my life, only to my work." 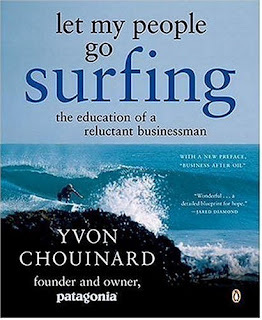 Excerpts from Let My People Go Surfing: The Education of a Reluctant Businessman, by Yvon Chouinard, founder and owner, Patagonia. Published by Penguin Books, 2005. Cover photo by Max Mills. We begin with the premise that all life on Earth is facing a critical time, during which survivability will be the issue that increasingly dominates public concern. Where survivability is not the issue, the quality of human experience of life may be, as well as the decline in health of the natural world as reflected in the loss of biodiversity, cultural diversity, and the planet's life support systems. The root causes of this situation include basic values embodied in our economic system, including the values of the corporate world. Primary among the problematic corporate values are the primacy of expansion and short-term profit over such other considerations as quality, sustainability, environmental and human health, and successful communities. The fundamental goal of this corporation is to operate in such a manner that we are fully aware of the above conditions, and attempt to re-order the hierarchy of corporate values, while producing products that enhance both human and environmental conditions. All decisions of the company are made in the context of the environmental crisis. We must strive to do no harm. Wherever possible, our acts should serve to decrease the problem. The functionally driven design is usually minimalist. Or as Dieter Rams, head of design at Braun, maintains, "Good design is as little design as possible." Patagonia's image is a human voice. It expresses the joy of people who love the world, who are passionate about their beliefs, and who want to influence the future. It is not processed; it won't compromise its humanity. This means that it will offend, and it will inspire. I'm a total pessimist about the fate of the natural world. In my lifetime I've seen nothing but a constant deterioration of all of the processes that are essential to maintaining healthy life on Planet Earth. Most of the scientists and deep thinkers in the environmental field that I know personally are also pessimistic, and they believe that we are experiencing an extremely accelerated extinction of species, including, possibly, much of the human race. Thinking these dark thoughts doesn't depress me; in fact I'm a happy person. I'm a Buddhist about it all. I've accepted the fact that there is a beginning and an end to everything. Maybe the human species has run its course and it's time for us to go away and leave room for other, one hopes, more intelligent and responsible, life forms. I don't really believe that humans are evil; it's just that we are not very intelligent animals. No animal is so stupid and greedy as to foul its own nest - except humans. ...To expect corporations to function any differently is to engage in make-believe. We may as well expect a clock to cook, a car to give birth, or a gun to plant flowers. The specific and explicit function of for-profit corporations is to amass wealth. The function is not to guarantee that children are raised in environments free of toxic chemicals, nor to respect the autonomy or existence of indigenous peoples, not to protect the vocational or personal integrity of workers, nor to design safe modes of transportation, nor to support life on this planet. Nor is the function to serve communities. It never has been and never will be. I have a different definition of evil from most people. Evil doesn't have to be an overt act; it can be merely the absence of good. If you have the ability, the resources, and the opportunity to do good and you do nothing, that can be evil. As Mahatma Gandhi said, "You must be the change you wish to see in the world."